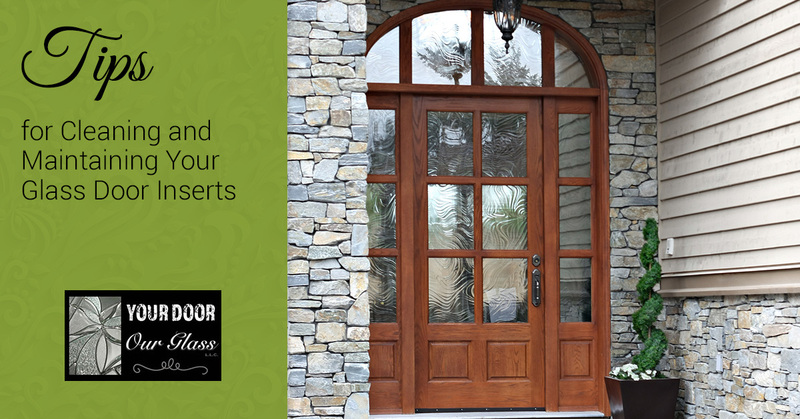 At Your Door Our Glass in Temecula, CA, we’re passionate about beautiful doors. Adding glass door inserts is a great way to increase the aesthetics of any door, from your home’s entrance, to interior doors that add a touch of elegance to any room. Keeping your glass door inserts clean is important for preserving that stylish look that inserts bring. Read these tips for cleaning and maintaining any doors that have glass inserts. There is a timeless quality that glass inserts convey, adding both style and an artistic flair to any home. Homeowners have many designs to choose from, with the glass being frosted or clear, and in some cases, with touches of color added for a dazzling effect. They’re also practical, letting light in while maintaining a sense of privacy. If you get glass door inserts to beautify your door, you’ll want to keep the glass clean so everyone can enjoy its classic beauty day after day. 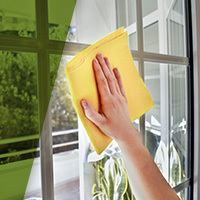 Using gloves, or with a duster, first remove any leaves, cobwebs, or other debris that have accumulated on the glass. Brush these away gently to avoid scratching any surfaces on your door. Next, prepare a gentle cleaner, such as dishwashing liquid mixed with warm water. Use a clean cloth to carefully wash the glass with the solution, then dry with another clean cloth. Alternately, you can use a vinegar and water cleaning solution, or your favorite store-bought glass cleaning product. We can offer recommendations on which cleaning products work best, and which ones to avoid. Try to keep water or glass cleaners from running down the rest of your door to avoid damaging the paint or the wood finish. If any liquid does run down, simply wipe it dry. To show off your sparkling clean glass inserts, you’ll want to shine up the rest of your door, too. Be mindful of what materials your door is constructed from and how it’s been finished, and be sure to use products and fabrics that will not leave behind scratches. Fiberglass and steel doors can be cleaned with mild soap and water, rinsed with clean lukewarm water, and dried thoroughly with a soft cloth. Wood doors also can be cleaned with mild soap and water using a non-abrasive sponge, then dried thoroughly with a soft cloth. Avoid scrubbing the finish or the paint off. Check with your door’s manufacturer to see if there are any recommendations for polishing the wood for a nice shine after it’s been cleaned. At Your Door Our Glass in Temecula, we specialize in door makeovers. Let us beautify your front door, and your entire entryway, by installing custom glass door inserts that instantly add a real sense of luxury to your home. Browse through our products to see our decorative glass designs for doors, or bring us your own ideas. As your glass door company, we’ll be happy to work with you to create the door of your dreams! We can help you design unique inserts to fit any size door, and to convey any look you want. Reach out to us today!